In the wildest offensive contest in Frontier Field history, the Lehigh Valley IronPigs out-lasted the Rochester Red Wings 20-18 in 10 innings Saturday afternoon at wind-swept Frontier Field. The combined 15 home runs hit by the two clubs set a new ballpark record. The series wraps up Sunday afternoon at 1:05 p.m.; it's the first Bark in the Park event, the first Knot Hole Kids' Club game, and kids can run the bases with Spikes and Mittsy after the game. Red Wings starting pitcher Chase De Jong ran into some trouble in the first, as after setting down the first two batters, he walked Dylan Cozens. After two passed balls in a row, Cozens scored on a fielding error by Wings third baseman Randy Cesar, giving Lehigh Valley a 1-0 lead. After a scoreless second for the IronPigs, the Wings capitalized off Lehigh starter Ranger Suarez. Brent Rooker started the inning with a single. After Luke Raley reached on an error by Lehigh Valley second baseman Sean Rodriquez, Wynston Sawyer ripped a two-run double down the left field line, giving Rochester a 2-1 lead. But, the Wings were not finished, plating three more runs in the inning, as Zander Wiel and Ronald Torreyes each picked up sacrifice flies, while John Andreoli recorded a RBI double to center, extending the Wings lead to 5-1. The IronPigs struck back in the third. After a fielding error by Adam Rosales and a single, Jan Hernandez lifted a three- run home run over the left field wall, cutting the Wings lead to 5-4. After De Jong set down the next two batters, De Jong gave up his second homer of the inning to Mitch Walding, evening the score at 5-5. . The Wings regained the lead in the bottom half, as Sawyer picked up his third RBI with a solo homer to left field, making the score 6-5. It was the first of the season for Sawyer. After a single by Cesar, Zander Wiel took Suarez deep, a two-run homer extending the Wings lead to 8-5. It was Wiel's first homer of the season. Wings pitcher De Jong made an early exit in the top of the 4th, after being ejected from the game following a high fastball that hit Hernandez. De Jong finished the game with five strikeouts, five hits, five runs (two earned) and a hit batter over 3.2 innings, throwing 46 strikes on 72 pitchers. 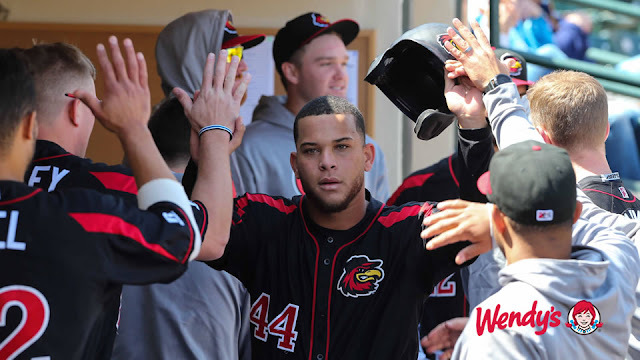 Fernando Romero relieved De Jong and got out of trouble with bases loaded, as catcher Wilin Rosario gunned down a stranded Lehigh Valley runner caught between bases. Rosario started the bottom of the fourth inning with a solo shot to left to keep the bats hot for the Wings. It was the third homer of the season for Rosario. Sawyer continued his impressive afternoon with a hard line drive in the gap to score a run, making the score 10-5 Red Wings. Sawyer suffered what appeared to be a hamstring injury while running the bases; he was tagged out and left the game. The IronPigs answered back in the fifth inning with three home runs to make the score 10-9. Suarez was replaced by JoJo Romero, having pitched 4.0 innings, allowing 10 runs (eight earned) with 12 hits, and three walks. Suarez struck out three and threw 84 pitches, 64 for strikes. Ronald Torreyes tacked on an RBI with a sac fly to start the scoring for the Wings in the fifth inning. Rosario's RBI single pushed Rochester's lead to three, 12-9. Romero left the game after 1.1 innings and was replaced by Preston Guilmet. In the sixth inning, Cozens and Romine hit back to back home runs for the second time of the day - this time off Guilmet - to cut the Wings lead back to one, 12-11. Lehigh Valley took the lead in the top of the seventh with three runs.. Entering the seventh inning stretch, the score was 14-12 IronPigs. The Wings drew level at 14-14 in the bottom of the seventh on a two-run shot by Rooker, the third of the season for Rooker. Lehigh Valley went ahead with two in the top of the eighth inning, but the Wings scored three runs in their half of the eighth - with Torreyes and Wiel each homering for a 17-16 lead. Austin Adams worked the eighth and ninth innings, and when Hernandez homered in the top of the ninth the score was tied again at 17-17 and the ballgame headed into extra innings. DJ Baxendale took the mound for the 10th inning, and with two runners on base Rodriguez homered to center field. It was the second homer of the game for Rodriguez, and the IronPigs led 20-17. The Wings scored a run in the 10th on an RBI single from Rosario. The Red Wings had the tying runs on base when Edubray Ramos struck out Rooker to end the game.